Oct 24, 2015Halloween Forever page 1. An Undead Sorcerer Lurks! Nov 14, 2015Halloween Forever page 4. All Hallows Eve Now and Forever! Nov 21, 2015Halloween Forever page 5. Pumpkin Man, Arise! 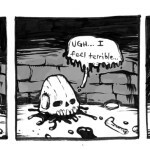 Dec 08, 2015Halloween Forever page 6. Pumpkin Man, Candy Corn Attack! Dec 19, 2015Halloween Forever page 7. Go, Pumpkin Man, go! Dec 19, 2015Halloween Forever page 8. Final page! 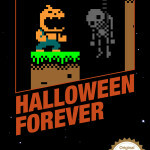 Become the True King of Halloween in Halloween Forever! Dec 08, 2009No 33: Let Him Go! Dec 14, 2009No 37: Go Grizzledude! Feb 05, 2010No 64: Who Chained Up Hungry Guy? Mar 01, 2010No 71: Who Locked You Up? Mar 02, 2010No 73: I'll Tell You Who! Mar 03, 2010No 74: She Devil Lady Jerk? May 26, 2010No 83: Who set you guys free? Jun 24, 2010No 92: Demon! Demon! Demon! Aug 02, 2010No 99: The Nether Lord!!! Oct 29, 2010No 114: Hello? Anybody? Dec 10, 2010No 119: Yikes! Jan 07, 2011No 127: What are you, Grizzledude?